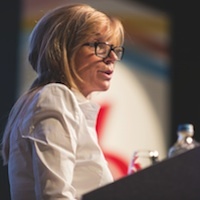 Powell had just taken part in the opening keynote session of IBC – The Rise and Rise of Broadcasting – and in her mind: “the consumers are more and more in control and TV has to adapt”. While others on the panel agreed that multiple devices and on-demand viewing are becoming more important, they also offered some caveats. For Brian Sullivan, CEO of Sky Deustchland, the emphasis for content makers and providers (perhaps obviously from his perspective) has to continue to be on pay TV platforms. Discovery has long been on the cutting edge of technology advances in TV – in digital, HD and 3D channels and recently the global leader in factual television bought Revision3, a California new media studio that makes content for the web. This obviously worries Hollinger. Discovery will spend $1.2bn this year on content and interestingly, advertising is “as important” as affiliate fees. Fully one third of Discovery’s international operating profit comes from advertising and the figure in the US is half from advertising. Powell offered that there is huge importance on “windowing” product for different distribution platforms and she said Disney is looking closely at creating both free and pay channels on YouTube. The BBC’s Director of Policy and Strategy John Tate called this phase of broadcasting one of “digital pervasiveness” and the issue is how to get audiences to participate in creating content as well as being viewers. “There is a technical challenge to that but at the heart there is profound creative challenge,” he said.